The first installment in this series can be found here. With so many local, national, and international causes already being supported by your customers’ generosity, how can you compete with them and the businesses that sponsor them? Consider the following, which could help bolster your cause marketing program. For each dollar that you collect, you need to show how and where these funds were distributed. Consumers who do not see any progress associated with the money they donated may very well choose not to donate anymore. Be sure to indicate on your website, in your promotional activities, and in-store that money collected helps to do great things. Perhaps a member of your business has suffered from a disease that could benefit from a donation. If this is the case, ask him or her to be the “face” of the effort. In the Wharton Business School article "To Increase Charitable Appeal to the Heart-- Not the Head", it describes how consumers are more likely to donate to a cause if “presented with a personal case of an identifiable victim” through pictures and stories, “something that purely engages the emotional system”. For example, we can all probably think of at least one product that dons a pink ribbon in honor of breast cancer research. One of the businesses that does so is J. Lohr Vineyards & Wines. The winery actually began partnering with cause organizers due to a family member’s breast cancer fight. Founder Jerry Lohr lost his wife, Carol, in 2008 and through sales of both J. Lohr Carol’s Vineyard Cabernet Sauvignon and Sauvignon Blanc, the company had a 2014 goal of “providing over 4,000 mammograms to women who would otherwise be unable to afford them”. Certainly, the cause is worthy enough, but by associating a name, story, and image of Carol Lohr, we begin to associate the brand with a real family – not just a business. Image 1. 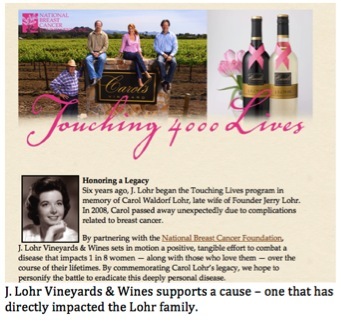 Screenshot of the J. Lohr Vineyards website that details their mission to provide mammograms to women in need. Or perhaps there is an environmental issue that greatly impacts your city/state/region. 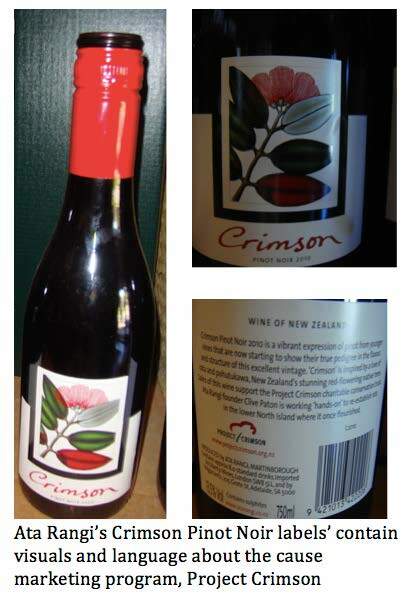 Sales from Crimson Pinot Noir, produced by Ata Rangi Vineyard (Martinborough, New Zealand) supports Project Crimson, “to protect and renew our spectacular red-flowering rata and pohutukawa – New Zealand’s iconic native ‘Christmas trees’.” Not only can consumers support the cause by purchasing this wine (Image 2), they can also purchase Northern Rata trees and plant them on their own property (Image 3). Image 2. Label showcasing the partnership with Project Crimson. Image 3. 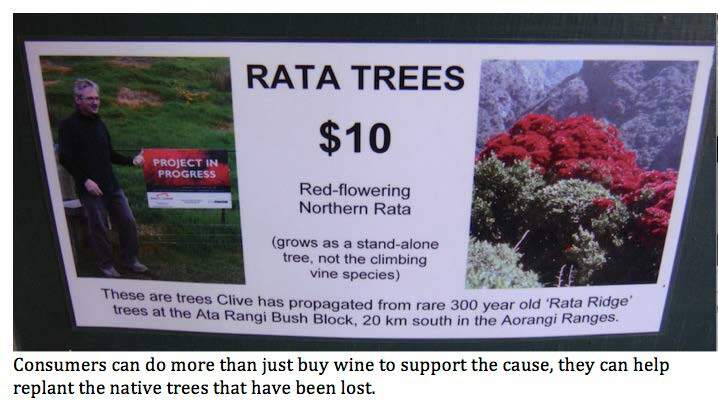 Sign advertising the sale of the rare Rata trees. More considerations on creating a cause marketing program to follow in part 3 of this series!